CNN released a new feature this week to spotlight the most "Badass Women of Washington." Boy were people surprised to see Kellyanne Conway make the list. There's no reason why she shouldn't be on there though. In 2016 she became the first woman to manage a winning presidential campaign. She's also a White House counselor to President Trump and does frequent media hits to promote the president's agenda. Oh by the way, she's also a wife and a mother to four children. She is, as CNN noted, "doing it all." Conway has butted heads with the network's anchors over the past two years, most notably Chris Cuomo. Those two are infamous for their loud, drawn out debates. Yet, they had had to name Conway one of D.C.'s "badass women" because she is, after all, a "survivor." There's been some serious turnover in the Trump administration, but she remains standing. The profile details how Conway's upbringing gave her a solid foundation, and how her boldness has propelled and sustained her political career. One of the most intriguing parts of the interview was when she explained to CNN how she manages to have so much influence in the administration. Conway said her relationship with the President "is such that I know he hears me." "He hears and listens to any number of people. Why does he hear me? Because I always tell him the truth." And the fact that she's a woman? "I think my gender helps me with the President in that he has never been afraid, and in fact, always been willing to treat men and women in his employment the same," she said. "I don't feel like he listens to me any less or any differently, or any less seriously." 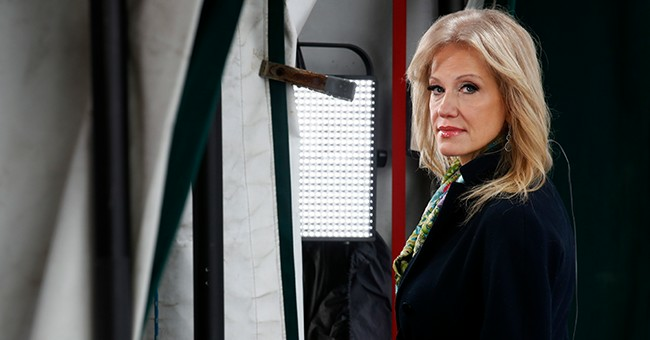 Recently, Conway has found herself in the middle of the very public feud between her boss and her husband. She deserves an accolade for that alone, IMHO.